If you want to find a better job or take the first step on a pathway to a career, then you need to earn a high school equivalency credential. It is required for college and more important than ever to employers. Taking the HiSET exam can help change your life and expand your opportunities like it’s done for other test takers. If you didn’t finish high school, there is another way to demonstrate you have the same skills and knowledge as a high school graduate — through testing and earning your high school equivalency (HSE) credential. YOU WILL NOT BE PERMITTED TO TEST! Before you take the test, there are things you need to do and know. Stay on track with your HiSET® test experience. Here’s a checklist to help you stay focused and organized. Want to use this checklist later? Download it (PDF)! Your test center is more than just a place to take your exam. The staff can also be a resource to help you if you have questions about the process, and they’ll know your state or jurisdiction’s policies. Finding a test center near you is easy with our test center search. Search by ZIP code or test center name, and choose whether you’re looking for paper or computer testing. The HiSET exam is offered at many different locations, including community colleges and adult learning facilities, so you have lots of choices. Search for test centers in your area. You can set up the account yourself, or a HiSET Customer Service representative can help you. How much it will cost you to take the HiSET exam depends on where you’re taking the test. Payment and refund policies vary, too. Get information about fees, payment and refund policies. If you have a disability or health-related need and require testing accommodations, you must request your accommodations through ETS before you schedule an appointment to take the exam. The approval process can take six weeks, so make sure to leave yourself enough time to submit all the necessary information before your test date. When you’re ready, check available test dates online or call your local test center. In some states or jurisdictions, you can use your HiSET account to find available dates and times. The exam can be taken on most days when the test centers are open. The HiSET exam is made up of five subtests. You can take them on different days, or take more than one on a single day. In most states you can schedule the subtests in any order. Learn more about scheduling your exam. There are two ways you need to prepare. First, you need to know the content that’s on the test. Use our free and low-cost test preparation materials to familiarize yourself with the test content, question formats and other information about the test. Next, you need to make sure you prepare for the test day itself. You’ll need to know what to bring to the test center — including valid ID — and what to expect on the day of your test. Read about taking the test. What is a HSE credential? If you left high school before graduation, you can demonstrate that you have the same skills and knowledge as a high school graduate by taking a HSE test. Once you pass the test, your state or jurisdiction will issue you a HSE credential. Why is a HSE credential important? If you didn’t finish high school, you know your opportunities are limited. But with a state-issued HSE credential, you’ll have the opportunity to advance your career, join the military, begin a training program or continue your education on the college level. What is the difference between the GED® test and a HSE credential? The GED® test is one of three tests used nationally to award a high school equivalency credential. Until recently, it was the only test available. Today, there are two other testing options available — the HiSET®exam and the TASC™ test. New Jersey uses all three tests to measure high school equivalency skills in language arts, mathematics, science and social studies, and all three enable you to earn the same HSE credential. How do I prepare for the HiSET exam? Most test takers take adult education classes to prepare for the exam. In many states, these programs are at no cost — or very low cost to the students. 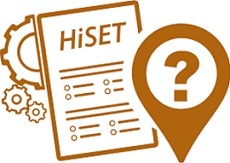 The HiSET program encourages you to explore adult education programs and also offers a variety of free and low-cost resources to help familiarize you with both the exam questions and the computer-delivered testing experience. The resources include a study companion (a guide with tips and strategies on how to prepare for the HiSET exam), practice tests and sample questions. What happens after I pass the HiSET exam? After you’ve passed the HiSET exam, your state or jurisdiction will issue your high school equivalency credential — and you can be confident that your skills and knowledge are on the same level as a traditional high school graduate. 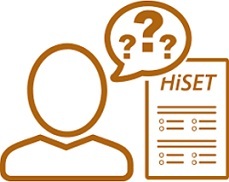 Frequently Asked Questions about the HiSET exam.